One of the apparent paradoxes of modern poetry has been the persistence of the epic, narrative verse and the long poem in the face of the proliferation of increasingly shorter and more condensed lyrics. How is it that very long, book-length poems continue to be written and published despite the overwhelming preoccupation with either short closed forms (the sonnet is proving rather popular with some Australian poets) or minimalist wordplays by more experimental writers? Two new books provide very different but equally convincing answers to this question. Yankunytjatjara/Kokatha poet Ali Cobby Eckermann’s Ruby Moonlight is one of the best manifestations of the Australian narrative verse since the earlier works of the late Dorothy Porter. As with Porter’s Akhenaten, Cobby Eckermann’s book – her fourth since her breakthrough 2009 debut chapbook little bit long time – is situated in the milieu of historical fiction. And, much like Porter’s, the precision and sharpness of Cobby Eckermann’s lines penetrate the facade of a linear plot to reveal the personal, the intimate and the sensual. Rhythm, repetition and consonance, among other things, provide these lines with their poetic elegance and semantic unity. 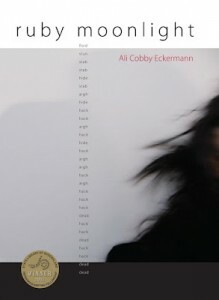 But Cobby Eckermann’s poem is not simply a skilful fusion of narrative and verse; what makes it a unique, almost groundbreaking, work is the poet’s ability to create a new space within the genre of Australian historical fiction that expands on the existing concepts and preoccupations. 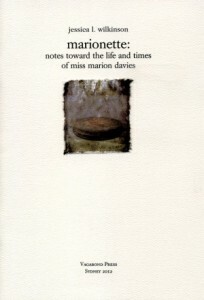 Novels about colonial-era conflicts and interactions between the Indigenous and white settlers have come to constitute an identifiable literary genre – thanks to the recent successes of Kate Grenville’s The Secret River and Kim Scott’s That Deadman Dance, among others – and Cobby Eckermann’s book is both a contribution to and in some ways a subversion of this genre. marionette is a terrifically promising debut publication, and I greatly look forward to reading the entire long poem (only some of which appears in this publication) in the form of a full-length volume. 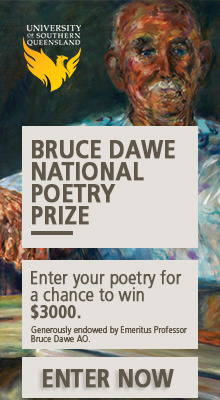 It is a testament, alongside Ruby Moonlight and a number of other recent long poems (such as Luke Davies’ Interferon Psalms and Kristin Henry’s All the way home), to the health and vibrancy of one of the most exciting genres of contemporary Australian poetry. Ali, wonderful review of one book that is assuredly a fascinating panoply of visual and syntactic processual experiments, I think Jess’s book is significant, and of another that I know little about, Cobby Eckermann’s, which sounds enticing, and it’s actually the sobriety and angularity of that excerpt you use, rather than emotional resonance, that stands out to me. Your isolation of Jess’s willful deviation from narration is a fine one, the figure of Marion Davies by this effect developed into all sorts of, though informed, non-biographical (and instead perhaps voices instead, a Bakhtinian polyphony), and in particular of the disqualified aspects of expression from a Randolph Hearstian monolithic capitalism, demonstrated for example by the grotesquerie of objects in the excerpt you use here. The figure by this repertoire of experimental techniques instates something that appears to me more human than history lends, and I’m so glad you emphasise here, Ali, the seriousness of techniques that for some appear etiolating of figuration or, even, personality, when as in the case of this chapbook it seems to me they do nothing but work in territories of thought disregarded (or suppressed, as the case may be) by conventional narratological methods, history, and even sociality. This is what Herbert Marcuse means by “counter-consciousness” as provided by poetry, by art. This leads me to my only reservation, the critique of playfulness. To me what Wilkinson proves is just the seriousness of playfulness, the very same, automatic writing as you quote after all a process of invocation of ghosts practised in ritual settings but exemplified in literature by Yeats’s transcribing the trances of his wife George Hyde-Lees, i.e. serious in the conventional sense only to transcendentalists. That’s another discussion. To poets, this are ‘means’. Then there’s the contingent seriousness of bricolage, and so forth. As is apparent with these methods, one cannot be “more serious” because they cut-up the newspaper or a book of philosophy than if they cut-up Babar or a car manual, it is the curatorship (the conceptual-sensible framework) and the process itself which are serious or non-serious. I only pose it since I think it’s the chance encounters interposed by the techniques effected by Wilkinson and the seriousness with which she goes about this “play” (what is deemed play for Randolph Hearst, play for a utilitarian-realist demand, play for the putative objectivity of the historian), and the degree of risk lent this, which is valuable. That and the apparent consistency of this polyphony of modes. I’m sure we ultimately agree, Ali, I just wanted to, I suppose, reflect on this and ask for your elaboration. Thanks for the very interesting, thoughtful comment, Corey. I think the nuance that didn’t come through in the review — and which requires a greater theoretical investment than what a review permits — is that these techniques as such (and certainly upon their advent by the modernists, etc) were/are indeed quite serious, precisely as you’ve said. My issue is with the fetishisation of these techniques by subsequent (post-modernist) poets which has created, in Badiou’s precise formulation, an avant-garde without the avant-garde (Badiou is here paraphrasing Robespierre’s famous dictum on revolution) which is exactly what i admire about Wilkinson’s work: her taking these techniques seriously (useful) after (or perhaps in the mist of) what I see as a rather long period of ‘experimentalism for experimentalism’s sake’. This discussion is in fact quite big and, in my view, very important, and would be definitely worth having at greater length. (And it’s one of the main points I’ll be trying to address in a book I’ll be writing soonish.) Thanks again, Corey. Great, gotcha, thanks Ali. Write write! A discussion of what a contemporary political experimental poetics might be may be worth having, but to what end I wonder, given the multiple teleologies and political positions sure to be taken (as evident in discussions of Lehmann and Gray’s Australian Poetry Since 1788 – unless it’s a polite like-minded left that’s having the discussion, where my point would hold) and the modal imposition used to suggest a present in future warping discussion. As to the point which raised the need for the discussion, a critique of playfulness in the marionette review, I didn’t read one, other than in a positive register, which makes me wonder even further. We’ll know it when we see it, so skipping the discussion may be the go. Whosoever has the wherewithal and drive to forge a contemporary political poetics should do so. The results will bring on the discussion. Possibly, Dennis. But the results — particularly in rather marginal cultural scenes like poetry — do not always promote discussion; they could simply get ignored, or, at best, be subjected to positive/negative feedback in a review. Reviews certainly have their place, but advancing discussions of contemporary poetry is not their raison d’etre. As for the value of such discussions, well, I think you’re right to question their merit since, exactly as you’ve put it, ‘it’s [usually] a polite like-minded left that’s having the discussion’. But there really are some fundamental disagreements around, for example, the extent to which a poem (e.g. a textually innovative one such as Wilkinson’s) could have a discernible ‘content’, or even the extent to which something as palpably wonderful as Cobby Eckermann’s Ruby Moonlight can be appreciated not only as a narrative but also as verse, all of which would then affect the poem’s evaluation and recognition by other poets and readers, publishers, prize-givers, and so on. I feel poetry is, perhaps more than any other literary genre, subject to the whims of (to borrow Stanley Fish’s term) an ‘interpretive community'; so the methods/philosophies/ideologies of interpretation, reception, etc, are, i feel, worth discussing. Anyhow, thanks for the comment. I’ll go on the fishing expedition if there is a classroom in the poem, not a poem in the classroom.